You all know I love Microsoft Small Business Server, and my mysterious case of the missing pictures last week highlights one of the reasons why I will implement this solution wherever possible with a permanent backup hard drive in place. First, a little background about this client. It’s a small company of about 10 employees; which do not include anyone with more than basic word processing skills. They had an XP system that was being used as a file server, and several other older desktop systems being used by the employees. A year ago, we installed a new Small Business Server Essentials and 6 new desktops. More importantly, we also installed a 2 TB external hard drive to host their server backups. When the new infrastructure was put in place, they wanted to keep most of the server folders open and editable for all users. A few days ago, the company’s “champion user” called the Bennett Business Connections Hotline in a panic; one of their event picture folders on the server had mysteriously disappeared and was nowhere to be found! The last time she recalled seeing the missing folder was a few weeks prior to her hotline call, and there was no evidence of how it was removed. As a proper Small Business detective, I assured her not to worry and that we would track down her pictures soon. To start the investigation, I logged in that evening and immediately accessed their backup. I wasn’t concerned about tracking down the data, I was worried about how far back we’d have to go to find it. To find the missing data, I launched the Restore wizard from the SBS console and started checking for the most recent backup that included the missing files. Aha! After some sleuthing, sure enough, a backup from 2 weeks prior contained the missing file. A few more clicks of the mouse and the mystery of the missing files was solved. What happened? It was elementary, my dear Watson: the files had all been accidentally deleted. SBS is designed for the end user, and in this case (pun intended) I could have easily walked her through the restore herself while I was driving on the highway. Yes, I was using hands-free. I do love SBS, but sometimes the design of the system allows users too much freedom to accidentally delete files. I would like to see more control and configurability for user permissions, like we have in the non-SBS servers. 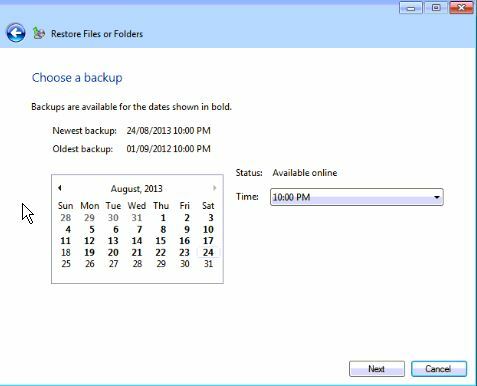 Bottom line…make sure you have a good backup solution in place at all times in case a user accidentally deletes data. PS: I did the restore while at a friends cottage overlooking the lake while tethered to my cell phone. Another great feature of SBS 2011 and Windows Server 2012 is their easy remote access. That is a great story with a happy ending Sharon! As I always say, small business IT may be designed to make life easier for the user, but that makes it even more important for you to implement enterprise level solutions, like a proper backup system and, where possible, auditing!